Collector 2013-W Proof American Platinum Eagle Coins are now available from the United States Mint. The Platinum Eagle went on sale today, July 18, 2013, at an opening price of $1,800.00. 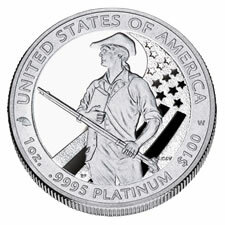 Each coin is struck from one ounce of .9995 fine platinum to proof quality. The maximum mintage is set at 15,000 with an initial household order limit of five coins. Despite their numismatic finish, investors may also be interested in the new release since associated bullion Platinum Eagles have not been produced since 2008. 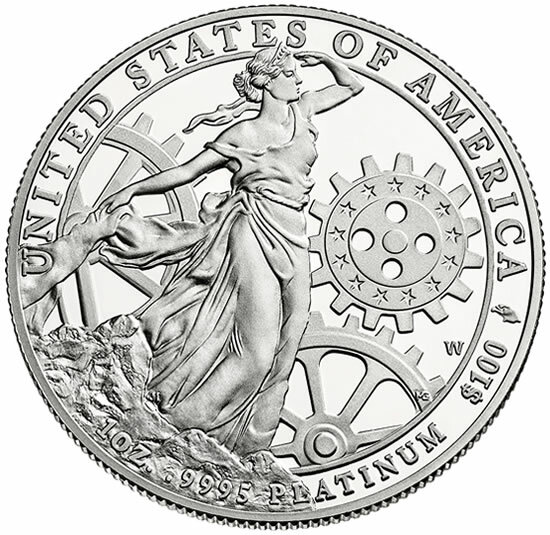 As such, these proofs are the only platinum coins issued by the U.S. Mint. 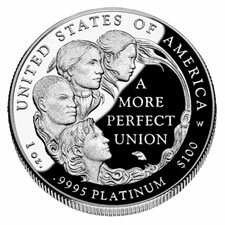 This year’s coin is the second to last in the "Preamble Series." Like others of the program, the reverse commemorates one of the six principles of the Preamble to the U.S. Constitution. For 2013, the commemorated principle is "To Promote the General Welfare." 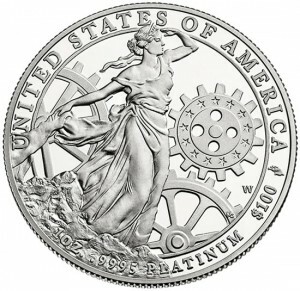 The 2013 Platinum Eagle "depicts Young America against a backdrop of interlocking gears, symbolizing the interconnection of power between the states and the national government," describes a news release from the U.S. Mint. "The design also includes an American Eagle privy mark from an original ‘coin punch’ identified at the United States Mint at Philadelphia." This design, by United States Mint Artistic Infusion Program Master Designer Joel Iskowitz, won over other design candidates that were created for consideration. Reverse inscriptions on the Platinum Eagle read UNITED STATES OF AMERICA, 1 oz., .9995 PLATINUM and $100. 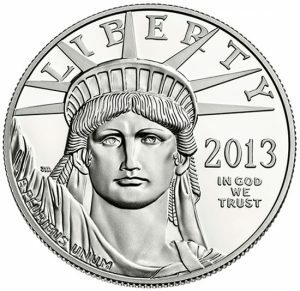 Lady Liberty appears on the obverse of the coin. This design has been on Platinum Eagles since their introduction in 1997. It was created by former United States Mint Sculptor-Engraver John Mercanti. 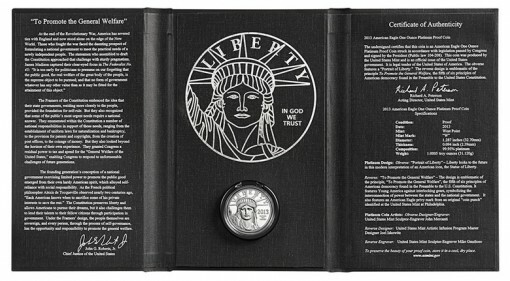 Inscriptions found on the obverse are LIBERTY, 2013 and IN GOD WE TRUST. 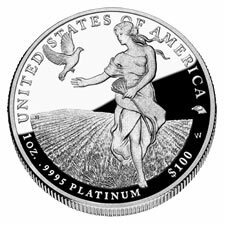 At $1,800.00, the 2013-W Proof American Platinum Eagle Coin debuts in the middle of inaugural pricing seen for previous releases in the series. Two of the earlier coins initially appeared at higher price points and two initially appeared at lower price points. 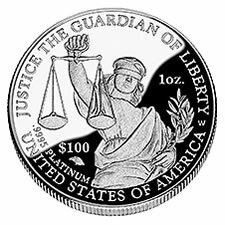 Prices for numismatic platinum coins are reviewed weekly and are based on a United States Mint pricing matrix that ties them to the movement of platinum. The starting price is based on a weekly average for London Fix platinum that is within $1,400 to $1,449.99 an ounce. *Last year’s Platinum Eagle remains available. The "as of date" for its sales above is July 14, 2013. The 2013-W Proof American Platinum Eagle Coin is available directly from the United States Mint through the coin’s dedicated online page or by phone at 1-800-USA-MINT (872-6468). Each comes packaged in a custom-designed portfolio presentation case that includes a copy of the associated narrative from Chief Justice Roberts. This is an awesome piece. 15,000 mintage not bad. T-Minus14,999 remaining and counting. Hope it does very well. Nicest looking of the designs so far! Have you noticed year 4 mintage, the least expensive of the group to date? Again I say the Mint would do far better limiting series to four years! For a coin that costs so much I doubt they’re being collected because of the reverse theme or designs. Still I’m interested in what their thinking will come up with for the 2015 and beyond reverses. Yeah – no one collects coins based on their theme or design. If I could afford only one, what would I use to make my selection? Ah yes, the packaging. It’s got to be just the packaging. Never the coin design.